Own A Business In A Fast Growing Market! 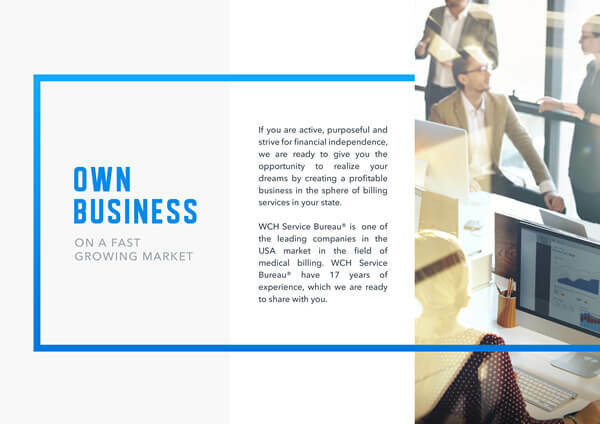 WCH Service Bureau® offers an excellent business opportunity to help you and your company significantly raise your income. We want to can help you and your company to become profitable and powerful in market and increase your retention in billing world. 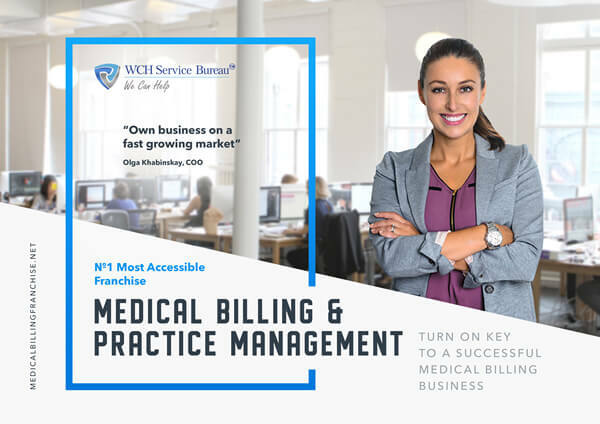 Since 2001, WCH Service Bureau® is a leader on medical billing, software developing, audit and credentialing markets. Continuous support and recommendations offered through Franchise guarantee your company's position in the business community. WCH owe's a unique work professionalism and know all specifics of driving this business. WCH Service Bureau® offers a ready to use business model along with additional support in signing up new clients. 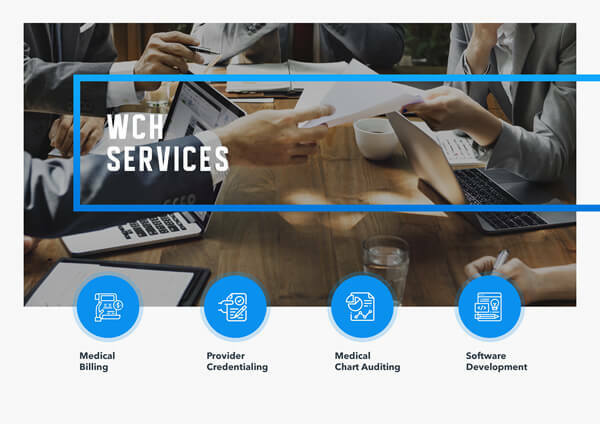 We willingly assist you with preparation and launching your business, provide with modern and user-friendly Software Products developed by WCH Team. We will train you and your employees, even if you have not previously been experienced in this field and will accompany you in each step. From the very start, unlike other companies WCH Service Bureau, Inc focused on sales and marketing department. We organized Call Center, created software programs, developed applications and our own database in order to conduct the business smoothly. This allowed us to identify the most effective methods of selling in the area. These methods are unique since we had to study everything on our own mistakes and financial loses. Now that the business strategies have been proven successful and the workflow has been perfected by meticulous attention to details, we are ready to share our experience with you. 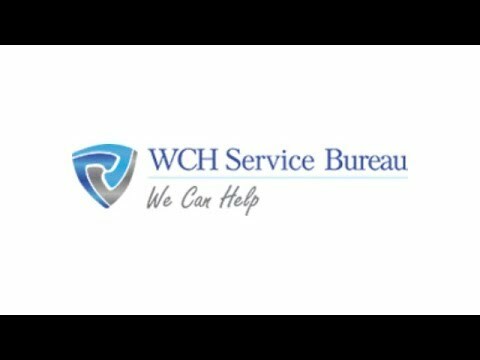 Why WCH Service Bureau, Inc Franchise? The franchise we offer is a ready-made and thought-out business model resistant to crisis. The model of the company that has been successfully operating in the market for decades and gained a recognizable name. It is a worthy project as it saves your time and investments. Ongoing support and consultancies are among many other advantages of becoming WCH Service Bureau, Inc franchisee. You will not have to learn how to do business spending decades on the learning process. Instead, you will get all the necessary knowledge and expertise from the franchisor. Maintenance at all the stages of building and running your business. Our goal is to work closely with you and your employees in order to increase revenue. 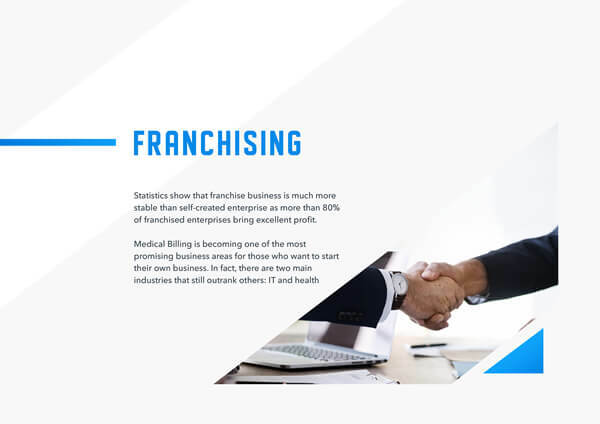 This will be implemented with the help of effective work concepts and necessary software programs which will form the basis of the franchise leading you to your financial success. Remember that Your Success is Our Success. WCH Service Bureau® characterized by a unique system, including unique methods, formats, standards, procedures, operating, a training procedures using special teaching techniques, course instructions, and manuals; advertising and promotional programs and materials (the "System"). The global medical billing outsourcing market was valued at nearly USD 6.3billion in 2015. By 2024 it is expected to reach USD 16 billion. More than 65% of all medical billing and coding activity is concentrated in these 21 US states: Florida, Georgia, North Carolina, Tennessee, Texas, California, New York, Arizona, Nevada, New Mexico, Louisiana, South Carolina, Alabama, Mississippi, Kentucky, Illinois, West Virginia, Missouri, Massachusetts, Ohio and New Jersey. Please call Alex directly at (347) 492-5355. WCHSB is currently accepting inquiries from the following states: Alabama, Alaska, Arizona, Arkansas, California, Colorado, Connecticut, Delaware, Florida, Georgia, Hawaii, Idaho, Illinois, Indiana, Iowa, Kansas, Kentucky, Louisiana, Maine, Maryland, Massachusetts, Michigan, Minnesota, Mississippi, Missouri, Montana, Nebraska, Nevada, New Hampshire, New Jersey, New Mexico, New York, North Carolina, North Dakota, Ohio, Oklahoma, Oregon, Pennsylvania, Rhode Island, South Carolina, South Dakota, Tennessee, Texas, Utah, Vermont, Virginia, Washington, Washington, D.C., West Virginia, Wisconsin, Wyoming.